In my previous Bunny Ranch Blog post (HapaToki), I discussed my passion for music and the incredible significance and awesomeness of KPop (Korean Pop) worldwide. Not to mention, I also wrote and produced a song called, ‘HapaToki,’ and made a music video for it right here at the Moonlite Bunny Ranch! However, it’d be unconscionable as a half-Korean American to overlook one of the most important characteristics of Korean Culture, and that is the FOOD! I genuinely delight in celebrating my Korean heritage (and all cultures across the globe, for that matter), and I’ve always loved cooking (especially Korean food), so I thought it’d be so much fun to show you how to cook a couple of very popular Korean dishes: Bibimbap and pork / veggie potstickers! ‘Bibim’ means ‘mixed’ and ‘bap’ means ‘rice.’ Potstickers are called ‘mandu’ in Korea. The beauty of these dishes is that they can be altered to your preference. For instance, Bibimbap can incorporate any combination of sautéed protein / veggies of your choice (such as beef, onions, zucchini, and kimchi), all of which are presented beautifully on top of a large bowl of white rice. Then, placed on the very top is an over-easy egg and a dab (or lots) of red pepper sauce called ‘Gochujang’. There are also many kinds of potstickers (mandu), such as veggie, chicken, pork, and even spicy kimchi, traditionally served as an appetizer / side dish with soy sauce for dipping. 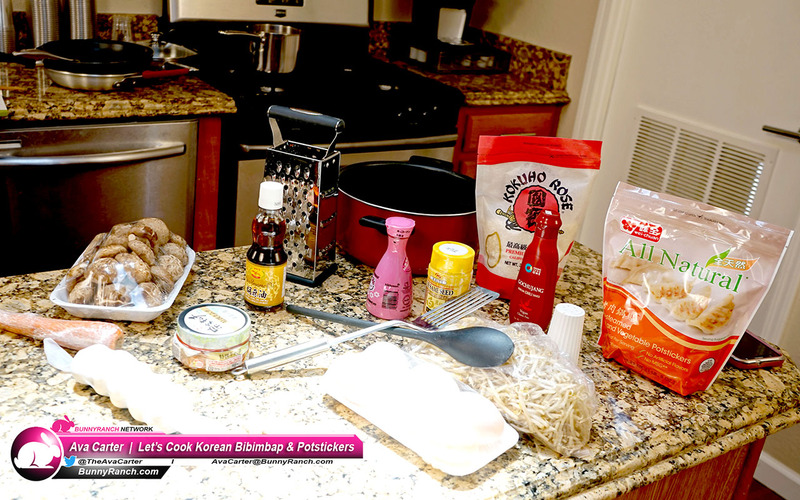 I hope you’ll consider spending time cooking with me, or simply enjoy a home-cooked Korean meal created with lots of tenderness, care, and love by yours truly. Rinse and drain the white rice thoroughly under cold water until the rice water is no longer milky white (or appears to be clear). Combine with 1¼ cup of water in a large pot and bring to a boil. Once it begins to boil, cover with a lid and adjust heat to low. Let it cook for approx. 20 minutes. Once finished, set aside and gently fluff the rice with a fork. Keep covered. As the rice cooks, begin prepping veggies by rinsing thoroughly under cold water. Bring a separate pot of water to a boil and add the mung bean sprouts. You’re only blanching them, so do not let them boil any longer than 3 minutes. Drain and rinse in cold water to stop the cooking process. Set aside. Remove stems from the shiitake mushrooms and slice into ¼’ to ½’ thick pieces. Peel and julienne / shred the carrots. Peel and finely chop garlic. Set all veggies aside. To speed up the cooking process, heat a few large pans over low – medium heat. Add 1 teaspoon of vegetable oil to each pan. Divide the chopped garlic among each pan and saute for approximately 1 min. Add veggies and ¼ teaspoon of sesame oil to each pan. Add ½ teaspoon of soy sauce to the shiitake mushrooms. Cook all veggies for approx 4 min, or until tender. Set aside. In a separate pan, heat 1 teaspoon of vegetable oil. Add potstickers and gently fry for 5 minutes on each side (or until golden brown) over medium heat. Prep a large plate for the potstickers by placing a paper towel overtop (this will help remove any excess oil). Once the potstickers are evenly cooked, remove from pan. Once the excess oil is removed, discard paper towels and serve with soy sauce for dipping. In a separate pan, add 1 teaspoon of vegetable oil and heat over low – medium heat. Carefully crack open each egg, ensuring the yoke stays intact. Cook over low heat. As the egg slowly cooks, place rice in two large bowls. Fun fact: it’s common to see this dish served in a large metal bowl or in a hot stone / granite bowl, which allows you to thoroughly combine everything together! When served in the stone bowl, the rice continues to cook on the bottom and becomes crispy. Yum! The granite bowl version is called ‘Dolsot Bibimbap’. Next, place veggies (including kimchi) overtop the rice. At this point, the eggs should be cooked ‘over easy’. Gently transfer the eggs over the veggies and rice and garnish with the red pepper sauce and toasted sesame seed. Serve alongside the potstickers. Break the yoke and mix everything up together! Once mixed, you’ve officially created and tasted the deliciousness of Korean mixed rice, Bibimbap! So YUMMY! I hope you enjoy! One of the wonderful things about the ranches are the opportunities they provide to meet incredible young women who are talented in so many ways…and then you get to lose yourself in their passionate and intimate embrace. Previous Previous post: Size Matters – Less is More! Next Next post: Let me Nurture your Spirit with essential oils!